This is a 1900 Waterman 420 eyedropper-fill in Cardinal Hard Rubber with Sterling Silver “Filigree” overlay. 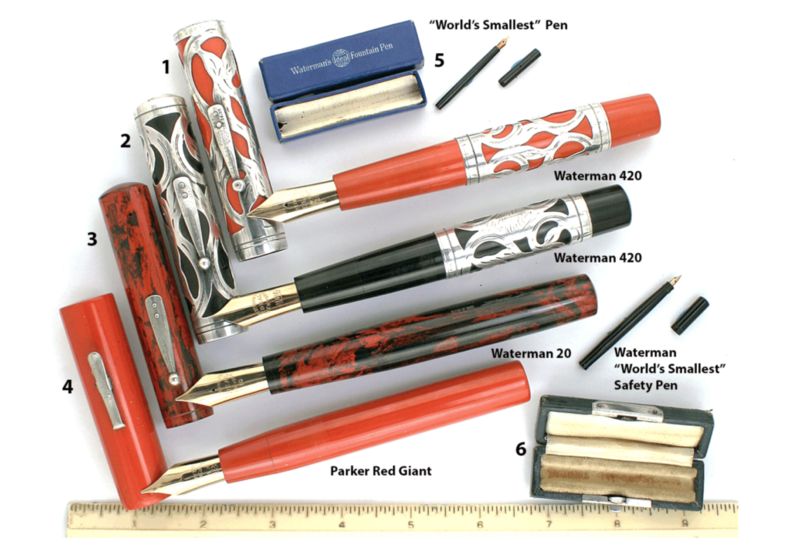 The “20″ was the largest pen Waterman produced, and it is strikingly beautiful in Cardinal Red and Sterling Silver. So rare, it is believed it was only produced by special order. Only two or three known to exist. There are some condition issues (which are reflected in the price), but the main thing is that both the hard rubber and sterling silver are intact on the cap and barrel. The only issue with the overlay top seam edge, which has opened along about 25% of the cap top and some signs of wear and use. Just under the cap top, on the back edge, in extremely small letters (I didn’t see it without my loop) is a previous owner’s name, “Bert Hart.” The clip ball is slightly crushed and there are scratches throughout the overlay noticeable with magnification. Signs of ink in the cap and barrel. The bottom is marked 420, with some wear in the center of the imprint. Despite the issues, it’s a wonderful example of a Holy Grail of pen collecting and, as they say, try to find another. Huge, No.10 nib (broad). Check out our Catalog to view this item’s availability! Item #1 in Catalog #86.